Winter is on its way to Evanston (although the recent snow might indicate that it’s already here), and that means it’s time to pull out those cozy clothes to make walking to class just a little bit less miserable. It sounds simple enough, but if you’re like me and you’re from a place with a warm climate, your closet may be lacking in winter clothes and you may find yourself having to go shopping. 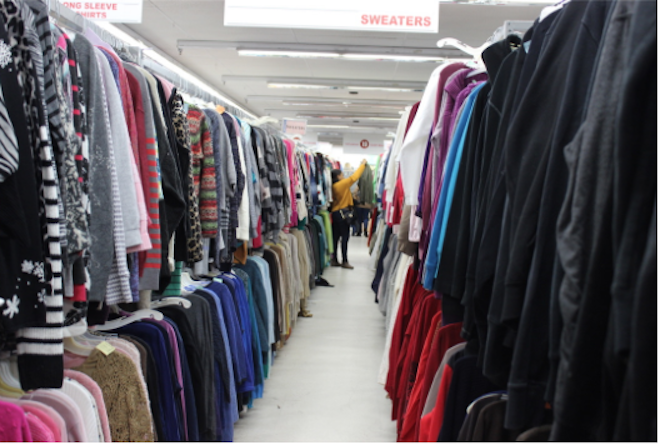 Instead of going to a department store or somewhere mainstream like Forever 21 and Urban Outfitters, check out Chicago’s thrift and vintage stores for some unique finds to complete your winter wardrobe. This Andersonville store is a part of chain of thrift stores and after visiting, I can see why it has been so successful in Illinois and Indiana. This location is ideal because it’s only a 40-minute “L” ride from Northwestern. The store looks small and unassuming from the outside, but when you walk in, it has an extensive interior with a variety of clothes, shoes and even household items. There are turtlenecks and sweaters in every color you could possibly imagine and the racks are color-coded, making specific shades much easier to find. This is definitely the place to go if you’re on a tight budget because most items, including jackets, are $8 or less. If you need a winter coat and don’t want to pay full price, there were plenty of high-quality North Face and Columbia coats offered for a fraction of the normal cost. On top of that, the store frequently has 50 percent-off sales, so you are able to pay next to nothing for a whole new winter wardrobe. The only downside is that occasionally I found something promising, only to discover it had a stain on it. But the store claims that it replaces its inventory everyday, so you’re definitely bound to find at least one item here that you like. When I read up on this store, several reviews said it was very eccentric, so I had high expectations going in, especially considering Boystown is known for having unique thrift and vintage shops. The first thing I noticed was how many Christmas items the store had. 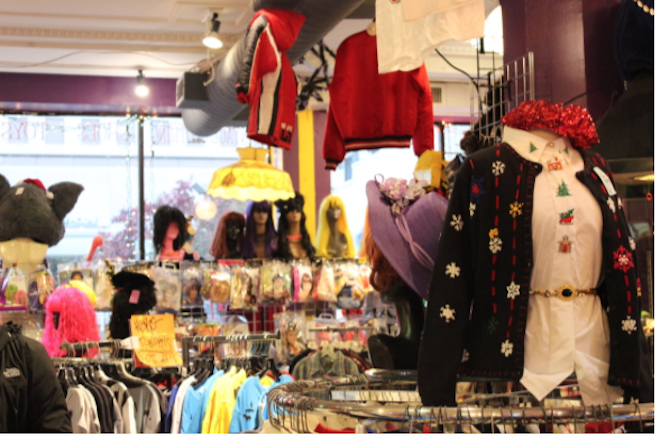 Hollywood Mirror has accessories like reindeer ears and a wide variety of ugly Christmas sweaters, making it the perfect place to turn to for the upcoming holiday parties. In terms of more everyday winter stuff, you can find playful ‘80s windbreakers to stave off the brutal cold. Because Hollywood Mirror is more of a vintage store than a thrift store, pretty much everything is organized by decade, so if you’re specifically looking for ‘50s dresses or ‘60s pants, you’ll have no trouble finding them. It’s clear that this store specializes in costume items, so you can find the complete Michael Jackson get-up or accessories like funky wigs, sequined blazers, wands, beards, eye patches or Santa’s special eye glasses. There are even boas and tutus hanging from the ceiling. This store is more for special occasions than for everyday shopping, so if you need a fancy outfit for a holiday party or winter formal, you should shop here. Also, because it is a vintage store, the prices can be on the higher side. For reference, an ‘80s windbreaker costs about $40 here. However, there was 20 percent off of all vintage items when I went, so you could still get reasonable deals if retro and classic clothing is your style. If the clothes are not up your alley, you should still go and check out some of their knick-knacks like matchboxes, Japanese erasers and friendship bracelets. I was most excited to go to this store because the website looked colorful and inviting. It is much smaller than the other two stores, which I actually liked because thrifting consists of a lot of sifting through pieces to find a few exceptional items and that can be overwhelming in a large store. Everything here is extremely organized so if you’re looking for bold vintage T-shirts, you know exactly where to go when you walk in. 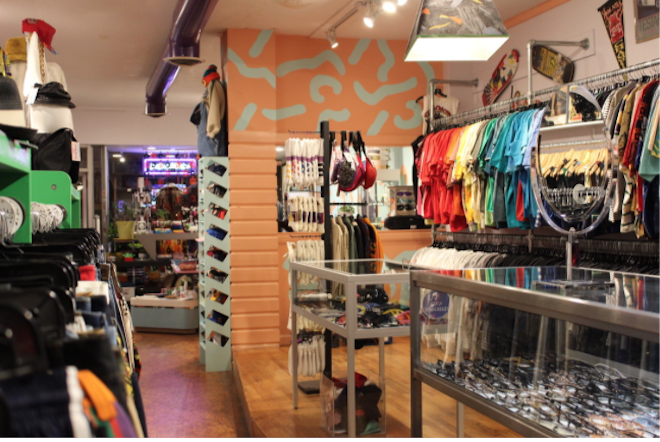 The whole store is marketed as ‘80s and ‘90s gear, so if those are your favorite decades to represent, this is the place for you. Even the music playing over the speakers is old rap and the walls are covered with pins and posters of all sorts of ‘80s and ‘90s pop culture, giving this store my favorite aesthetic out of all of the places I visited. For your winter needs, Kokorokoko has quite the collection of crewneck sweatshirts, which are my personal winter staples, because you can throw them on everyday and no one thinks anything of it. There are also some cool windbreakers once again (finding windbreakers is really the main reason I go to thrift stores) and a lot of gear for Chicago sports teams. There are cassette tapes (very ‘90s), hats, scrunchies, patches for all kinds of bands and unique rings. The only thing that could be wrong with shopping here is the average price. There is definitely a range of prices, with some items, like jackets, in the $40-50 range, and then some T-shirts that are $22-28, but if you save up to buy one item here and the cheaper items at another thrift store, it works out. If anything, it’s a great place for window shopping or browsing because of the atmosphere. While thrifting may take a little more effort than online shopping, you’ll benefit by having unique warm winter clothes that no one else has, instead of matching everyone in your 150-person lecture.